"I am ecstatic! My hopes for this album were that people would be moved, that the songs could bring about emotion... the euphoric heart of this album has taken flight and the response has been nothing short of incredible... my thanks as always to the many talented and dedicated people with whom I work and the fans who have been so supportive all these years." Pop diva, Kylie Minogue on news that her latest album, Aphrodite, went to number one on the UK album charts. Kylie Minogue is the first recording artist in UK chart history to have a number one album in four consecutive decades! 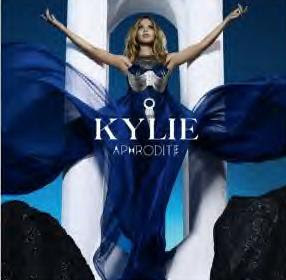 "Aphrodite" is Kylie's fifth # 1 album on the UK album charts. Kylie's first number one album on the UK charts was 22 years ago! Kylie (1988); Enjoy Yourself (1989); Greatest Hits collection (1992); and Fever (2001).